It was the day after Easter. We had to go back. But 1st we had to collect some beer. After filling up the van with crates & kegs & handing over empties I asked for T’s. 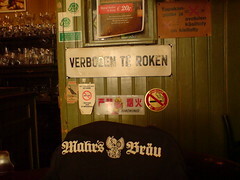 It resulted in a free T from Hummel, a stein from Schlenkerla (4 beers for on the way), a crate of beer from Beck (not the big one) & at Mahr’s I got the T for ½-price. I drank beer. I believe 5 of the free beers. It was the day after Easter, I suddenly realized. The 100th day of the year. The 10th of April. They had given me presents, while we all didn’t know.